The ridge in the right center of the photo shows where icebergs have broken off from Jakobshavn Glacier and tumbled into the water to form a slushy ice mélange — the world's largest granular material. Photo by Ryan Cassotto. The laws for how granular materials flow apply even at the giant, geophysical scale of icebergs piling up in the ocean at the outlet of a glacier, scientists have shown. 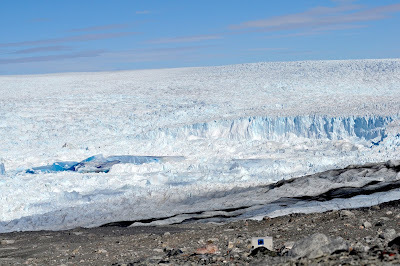 The Proceedings of the National Academy of Sciences (PNAS) published the findings, describing the dynamics of the clog of icebergs — known as an ice mélange — in front of Greenland’s Jakobshavn Glacier. 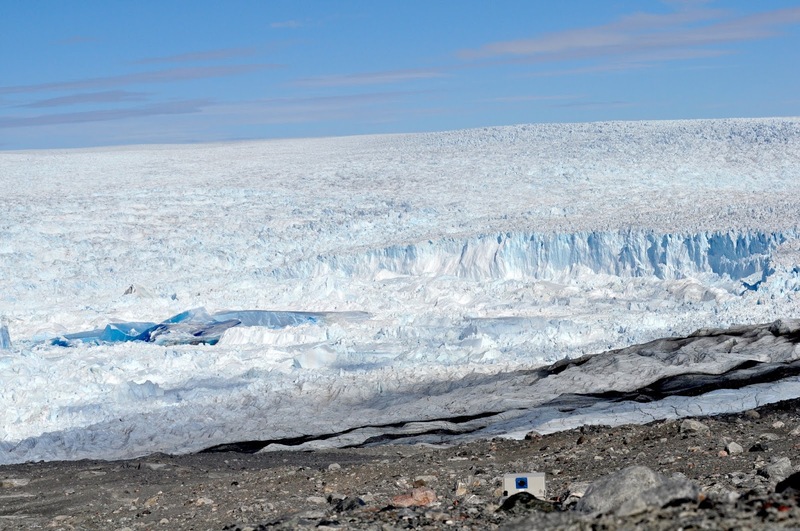 The fast-moving glacier is considered a bellwether for the effects of climate change. The National Science Foundation funded the research, which brought together physicists who study the fundamental mechanics of granular materials in laboratories and glaciologists who spend their summers exploring polar ice sheets. For thousands of years, the massive glaciers of Earth’s polar regions have remained relatively stable, the ice locked into mountainous shapes that ebbed in warmer months but gained back their bulk in winter. In recent decades, however, warmer temperatures have started rapidly thawing these frozen giants. It’s becoming more common for sheets of ice — some one kilometer tall — to shift, crack and tumble into the sea, splitting from their mother glaciers in an explosive process known as calving. Jakobshavn Glacier is advancing as fast as 50 meters per day until it reaches the ocean edge, a point known as the glacier terminus. About 35 billion tons of icebergs calve off of Jakobshavn Glacier each year, spilling out into Greenland’s Ilulissat fjord, a rocky channel that is about five kilometers wide. The calving process creates a tumbling mix of icebergs which are slowly pushed through the fjord by the motion of the glacier. The ice mélange can extend hundreds of meters deep into the water but on the surface it resembles a lumpy field of snow which inhibits, but cannot stop, the motion of the glacier. “An ice mélange is kind of like purgatory for icebergs, because they’ve broken off into the water but they haven’t yet made it out to open ocean,” Burton says. While scientists have long studied how ice forms, breaks and flows within a glacier, no one had quantified the granular flow of an ice mélange. It was an irresistible challenge to Burton. His lab creates experimental models of glacial processes to try to quantify their physical forces. It also uses microscopic particles as a model to understand the fundamental mechanics of granular, amorphous materials, and the boundary between a free-flowing state and a rigid, jammed-up one. “Granular material is everywhere, from the powders that make up pharmaceuticals to the sand, dirt and rocks that shape our Earth,” Burton says. And yet, he adds, the properties of these amorphous materials are not as well understood as those of liquids or crystals. In addition to Amundson, Burton’s co-authors on the PNAS paper include glaciologist Ryan Cassotto — formerly with the University of New Hampshire and now with the University of Colorado Boulder — and physicists Chin-Chang Kuo and Michael Dennin, from the University of California, Irvine. The researchers characterized both the flow and mechanical stress of the Jacobshavn ice mélange using field measurements, satellite data, lab experiments and numerical modeling. The results quantitatively describe the flow of the ice mélange as it jams and unjams during its journey through the fjord. The paper also showed how the ice mélange can act as a “granular ice shelf” in its jammed state, buttressing even the largest icebergs calved into the ocean. "I want to help Native American tribes to reclaim knowledge of their very ancient evolutionary histories — histories that have been largely wiped away because of colonialism," says Emory geneticist John Lindo. Photo by Kay Hinton, Emory Photo/Video. The ancient genomes of the Tsimshian indigenous people left tell-tale markers on the trail of their past, revealing that at least 6,000 years ago their population size was on a slow but steady decline. The American Journal of Human Genetics published the findings, which draw from the first population-level nuclear DNA analysis of a Native American group from ancient to modern times. Nuclear DNA provides information on an individual’s lineages going back hundreds of thousands of years. Lindo is one of the few geneticists looking at ancient whole genomes of Native Americans. He is especially interested in understanding how the genomes of their different populations evolved over time. The Tsimshian people historically lived in longhouses in coastal British Columbia and southern Alaska where they harvested the abundant sea life. Lindo and his colleagues sequenced the genomes of 25 living Tsimshian people and 25 ancient individuals who lived in the same region between 6,000 and 500 years ago, and confirmed that they were a continuous population through time. Members of the Tsimshian Native American tribe hold a tea party near Fort Simpson, British Columbia, in 1889. Image from the Library and Archives Canada. In a previous paper, drawing from the same data set, they found a dramatic shift between the two time periods in a class of genes associated with the immune system, suggesting a strong evolutionary pressure on the population to adapt to pathogens. A demographic model indicated a crash in the Tsimshian population size of about 57 percent during the early-to-mid 19th century. 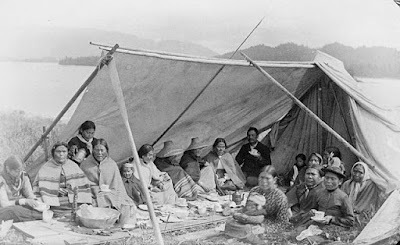 That finding fitted with historical accounts for how smallpox, introduced by European colonization, devastated the Tsimshian population during two epidemics within that time-frame. The current paper looked at broader genetic variations between the ancient and modern DNA. An analysis showed both how the variation declined slowly in the ancient population before the collapse, but has since recovered. 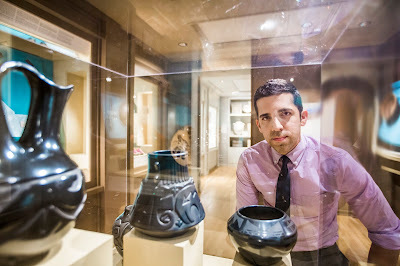 Intermarriage with other Native American groups and non-native populations increased the genetic diversity of some of the modern-day Tsimshian people so that it is near the levels prior to their population collapse, the analysis showed. Senior authors on the paper are Michael DeGiorgio from Pennsylvania State University and Ripan Malhi from the University of Illinois. The paper’s coauthors include Tsimshian representatives Joycelynn Mitchell and Barbara Petzelt from the Metlakatla Treaty Office in Prince Rupert, Canada. Malhi, a leader in forging trusting relationships between genetic researchers and indigenous people, was a mentor to Lindo, who earned his PhD at the University of Illinois at Champaign-Urbana. Lindo is continuing that tradition of building trust and working closely with indigenous populations. His ancient DNA research at Emory integrates the approaches of ancient whole genomes, statistical modeling and functional methods. One of his projects is focused on genetic fluctuations to help understand ancient adaptions in various Native American populations. He is currently working with 10 different tribes from throughout North America. “Community engagement is essential when working with indigenous communities,” says Lindo, explaining that he first meets personally with a tribal community to talk about how a genetic study might add to their knowledge of their own history. Most ancient DNA analyses have come out of Europe, where more ancient DNA labs are based and cold temperatures have helped preserve specimens. Lindo wants to bring some of the same insights that those of European ancestry are gaining about their past to Native Americans. A small crowd gathers in Emory’s White Hall before the menacing sight: Large rubber worms arrayed on triangular red spikes. The jagged spikes, from a few inches to more than a foot tall, lean crazily in all directions. Some of the worms — suspended on near-invisible fishing line — appear to rise off the spikes, escaping to a circular mirror hanging from above. The onlookers include a mix of college students, children and their parents, brought together by campus events during the recent Atlanta Science Festival. Joining the regular attractions of Physics Live! and Chemistry Carnival is the debut of an art exhibit by a new, student-run program called Science.Art.Wonder., or S.A.W. Just over 100 artists — most of them untrained college students — teamed with scientists from Emory and Georgia Tech to translate their research into art. Ethan Mock and his art, "The Crucible"
Mock worked with the lab of Levi Morran, an assistant professor in Emory’s Department of Biology who studies co-evolutionary dynamics by experimenting with a host (a microscopic worm called C. elegans) and a parasite (a bright red species of bacteria called Serratia marcescens that is lethal to C. elegans upon consumption). “The same thing,” one of the boys replies. Both artists and researchers engage with visitors as they peruse more than 140 works of art, set up on the Quad, in White Hall, the Math and Science Center and the Atwood Chemistry Center during the festival. “This artwork gives you a snapshot of how much research is being done in Atlanta. I’m taken aback by how cutting edge and varied it is,” says Pamela Romero, president of S.A.W. The program is the brainchild of Romero, a senior majoring in neuroscience and behavioral biology and minoring in computer science. The Emory S.A.W. contributions span labs across the University and beyond. 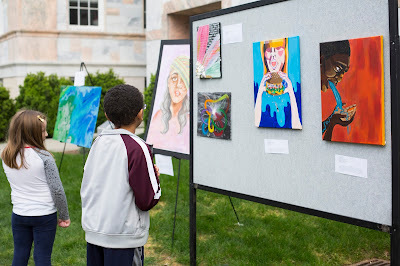 The artists picked their mediums, from acrylic to watercolor and everything in between. Emily Isaac, a first-year Emory student majoring in environmental sciences and theater, stands on the Quad next to a large watercolor she painted. 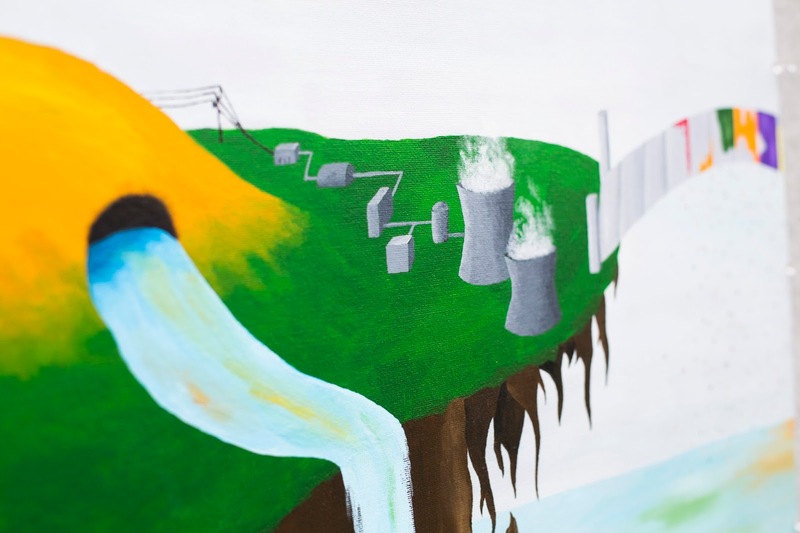 “Art can help scientists make a point without using any scientific jargon,” she says. She teamed with Robert Wallace from Georgia Tech’s Agricultural Technology Research Program. One of Wallace’s projects gave plots of farmland to women in India who had been victims of an acid attack. Isaac did a portrait of a woman with a scarred face. The woman’s head is partially wrapped in strips of bandages that Isaac painted to look like rows of newly sprouting plants. “I wanted to show hope, and how connecting with the environment can help people,” Isaac says. This year’s 36 Emory S.A.W. artists are mainly undergraduates — many of them science majors — but they also include a few graduate students, faculty and staff members. Georgia Tech makes up the bulk of other contributing artists and researchers in this year’s S.A.W., although 10 independent artists also got involved, along with Georgia State University undergraduates and the Atlanta campus of SCAD. 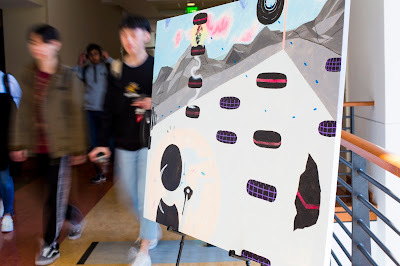 A painting by Georgia Tech student Bianca Guerrero portrays a virtual reality game used to measure players' perception of time as well as eye movement. The art is based on research by Georgia Tech psychologist Malia Crane. Photo by Ann Watson, Emory Photo/Video. As long as she can remember, everyone thought Romero would become an artist, or maybe an architect. She began taking art classes at the age of three in her home town of Tegucigalpa, Honduras. She continued making and studying art, developing a surrealist style. In ninth grade, however, a psychology course sparked a fascination for neurobiology. Romero took online classes and started reading up on subjects like optogenetics and deep-brain stimulation. Romero sought out kindred spirits like Nicole Gerardo, associate professor of biology, who also grew up with twin passions for science and art. 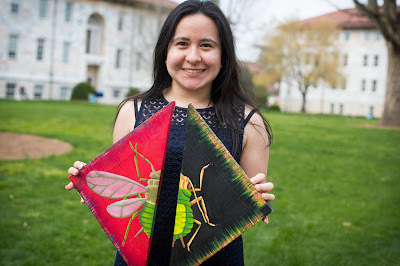 Gerardo once had students create artwork using microbes in her lab under the direction of Nancy Lowe — a former lab technician at Emory who went on to create a retreat center in North Carolina called AS.IF: Art and Science in the Field. 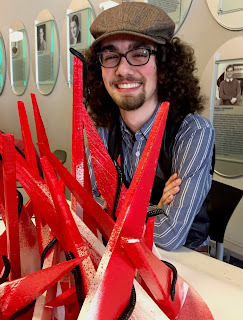 Gerardo later paired students with labs to create ceramic representations of research under the direction of Diane Kempler, who formerly taught visual arts at Emory. When Romero first joined forces with Gerardo it was simply to produce art for her lab, which focuses on evolutionary ecology. “We were test subjects for S.A.W.,” Romero says. 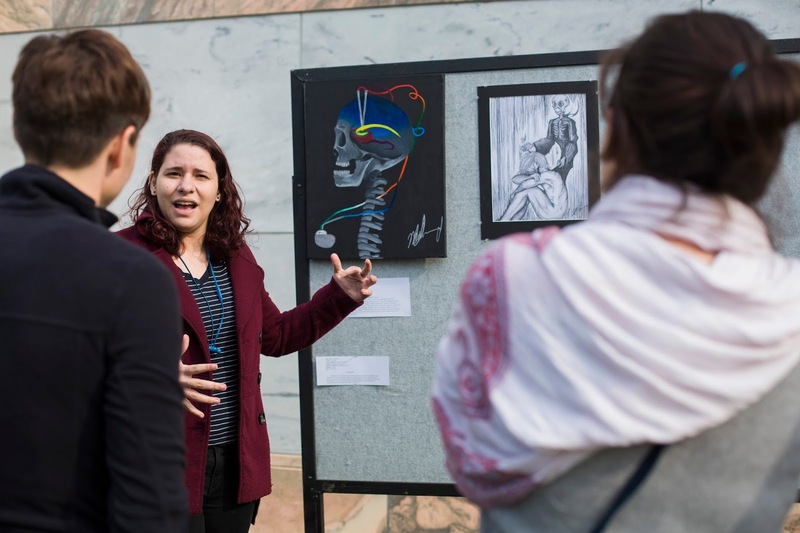 Emory senior Maureen Ascona, a neuroscience and behavioral biology major, discusses her art with visitors to the Quad. Ascona teamed with Helen Mayberg, from the Emory School of Medicine, who uses deep-brain stimulation to help patients with treatment-resistant depression. Photo by Ann Watson, Emory Photo/Video. One of the pieces Romero created consists of triangular canvases that can be shifted into different positions. The acrylic painting depicts how aphids develop wings in the presence of predators, like ladybugs, or if food becomes scarce. 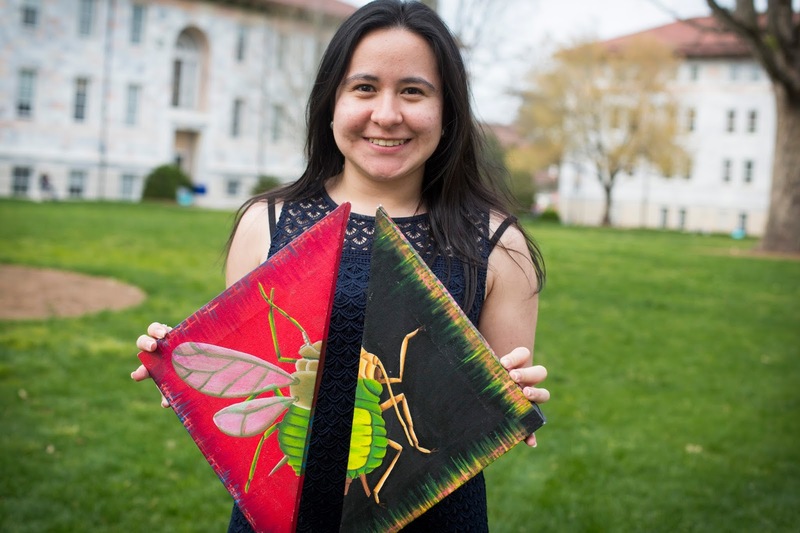 “When Dr. Gerardo explains her work to people, she can move the canvases to show how the aphids change in response to their environment,” Romero says. Romero wanted to give other students the chance to enter research labs and experiment with art. Connections from across the University helped S.A.W. grow. Wei Wei Chen and John Wang, student leaders of Emory Arts Underground, provided the platform for Romero to launch S.A.W. and encouraged her to form a charter, bylaws and an executive team. That team includes Emory undergraduates Alex Nazzari (vice-president), Aila Jiang, Veronica Paltaraskaya, Anne Pizzini, Deborah Seong and John Wang, along with Georgia Tech students Olivia Cox, Siyan Li and Iris Liu. The students’ efforts paid off with S.A.W.’s smash debut at the Atlanta Science Festival. A piece by Alice Yang, a first-year Emory student majoring in neuroscience and behavioral biology who teamed with researchers of human genetics in the Emory 3q29 Project. Photo courtesy of S.A.W. Exploring a lab through an art project allows students to develop a relationship with a researcher and often find a mentor, Romero says. Alice Yang, a first-year Emory student majoring in neuroscience and behavioral biology, teamed with Jennifer Mulle, assistant professor at Rollins School of Public Health. Mulle is co-principal investigator of the Emory 3q29 Project, which seeks to understand a genetic deletion associated with an increased risk for schizophrenia. To create her art pieces, Yang ordered special scratch-off paper from her native China. “This paper’s easy to work with and it’s great for showing patterns and textures,” she says. 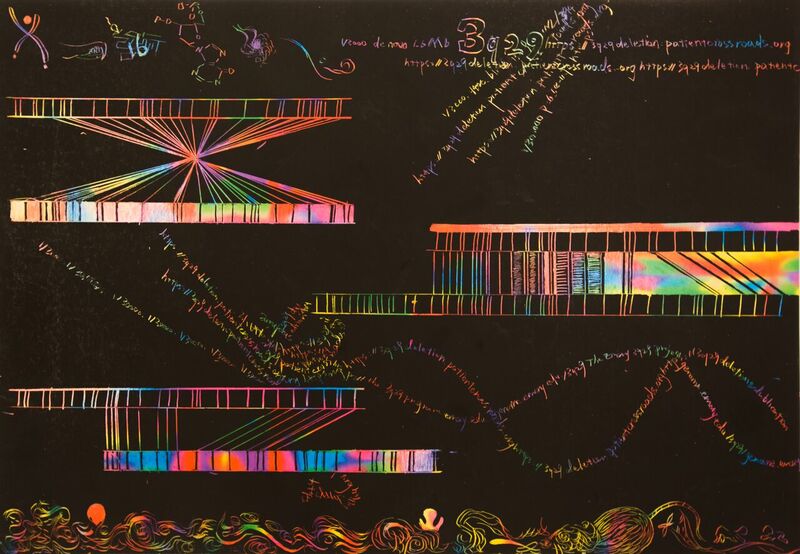 She explains how she carefully cut slices from the black top layer of the paper to reveal the glowing, rainbow colors beneath. Her pictures portray the nanomapping of fluorescent-labeled alleles from the 3q29 lab while also paying tribute to Salvador Dali’s surrealism. Even those who are not aspiring scientists can catch the science-art bug. Independent artist Aaron Artrip teamed with scientists Matthew Jackson and Dan Cook at Georgia Tech to demonstrate interaction with sound. A group of children buzzes around Artrip’s exhibit in White Hall. A piece of paper sprinkled with powdered black ink is taped to a wooden speaker, which is plugged into an electronic synthesizer. As Artrip taps a keyboard, the powder moves across the page, creating patterns. “I’m making drawings with vibrations. Forcing sound through the ink causes it to move,” he explains. “Would you like to try?” he asks a young girl watching him. She doesn’t have to be asked twice. Ultimately, S.A.W. hopes to find ways to integrate its art-science model into grades K-12. “We would like to have artists and researchers go into K-12 classrooms to talk about the art and the research together,” Romero says. She presented S.A.W. at the recent Georgia Tech STEAM Leadership Conference, which brought together educators and policymakers to explore new ways to teach science, technology, engineering, art and math, or STEAM. S.A.W. is now working to put together an anthology of its art into a booklet, to include descriptions of the science. The booklet will be aimed at high school students “to give them a glimpse of some of the possible fields available to them in college,” Romero says. S.A.W. is also creating a web site where the art will be accessible in digital form, including videos of some of the interactive art pieces, along with other resources for K-12 teachers. As she prepares for graduation, Romero is working on an art narrative piece funded by the Emory Center for Creativity and Arts. 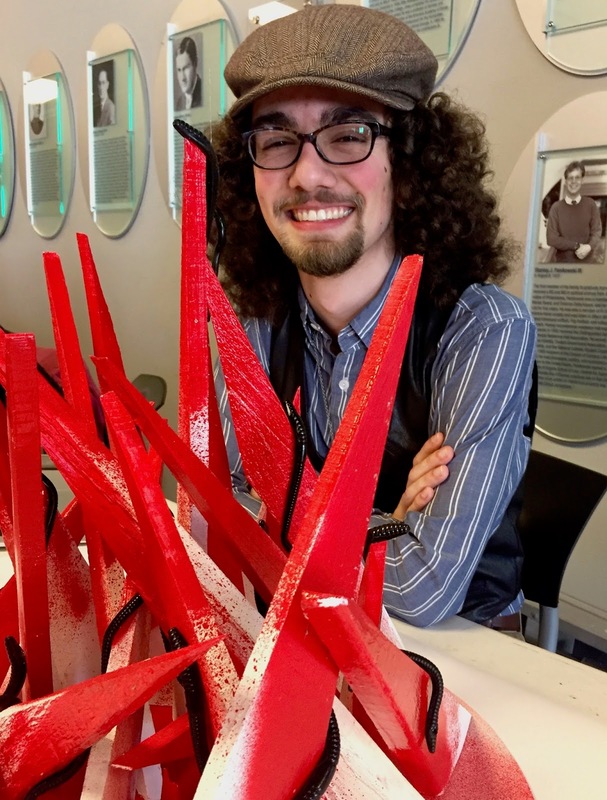 The work will combine acrylic painting and sculpture to represent the element Vanadium, discovered by Mexican mineralogist Andrews Manuel del Rio in 1801. A series of circular canvases will each represent an atom in Vanadium. Each canvas will also represent a country or group of countries in Latin America, on which Romero will depict the research of a scientist from that area. “My main goal with this piece is to celebrate and encourage more Latin American science,” Romero says. 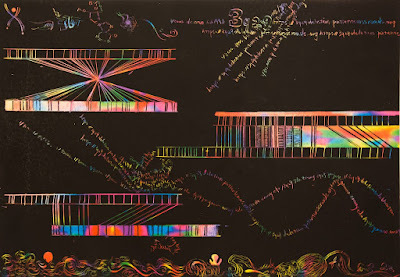 She is calling the piece “Elementally Latino,” to describe how Latinos are an elemental, or basic, part of science and how they also embody an elemental force. “Latinos are such a passionate people that I can only adequately describe them as a force of nature,” she says.